Mr. Eugene L. Spaniel entered into his eternal rest on Tuesday, April 9, 2019. He was 90 years old. Gene was born in the Witting Community, located between Moulton and Hallettsville, in Lavaca County, Texas on September 30, 1928 to Mary Jurek and Louis L. Spaniel. Being raised on a small farm when times were hard, lead to an acquaintance with many farm activities, including, hand milking cows and separating the cream, growing corn, cotton, and legumes, and raising market swine, sheep and poultry. Crop production was improved greatly on the Spaniel farm with the use of barnyard manure and planting legumes as green cover. This farm was the first in the county to use phosphorus fertilizer to enhance growth of Hubam and Yellow Blossom clover. Gene graduated from Moulton High School and from Texas A&M with a degree in Dairy Husbandry. He also earned a MS Degree in Ag Education from A&M. He served as Veterans Ag Instructor in Moulton from 1949 to 1951, at which time he entered the U S Army. He then joined the Extension Service in Harrison County (Marshall) in 1953 and moving to Wilson County in 1955 as County Agent. 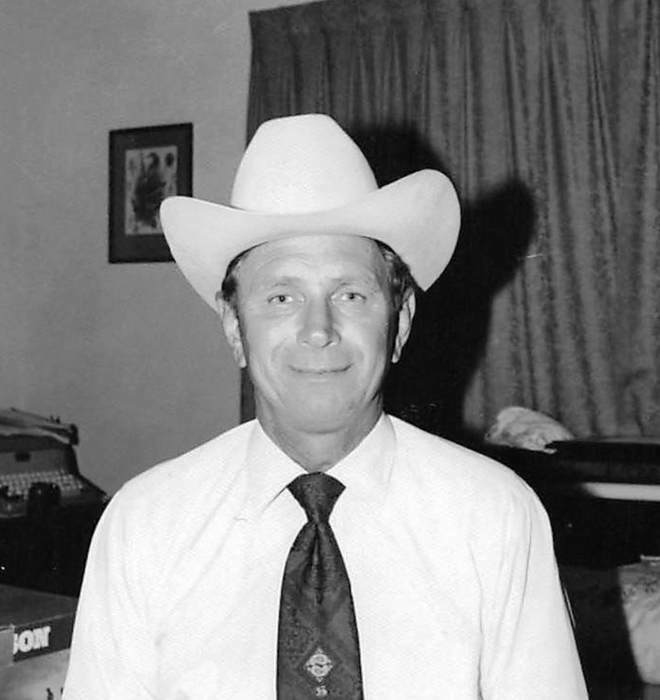 In 1964, he took the position of County Agent in Bee County (Beeville), where he headed the adult and youth program until 1979 when he accepted the County Agent position in Jim Wells County (Alice). 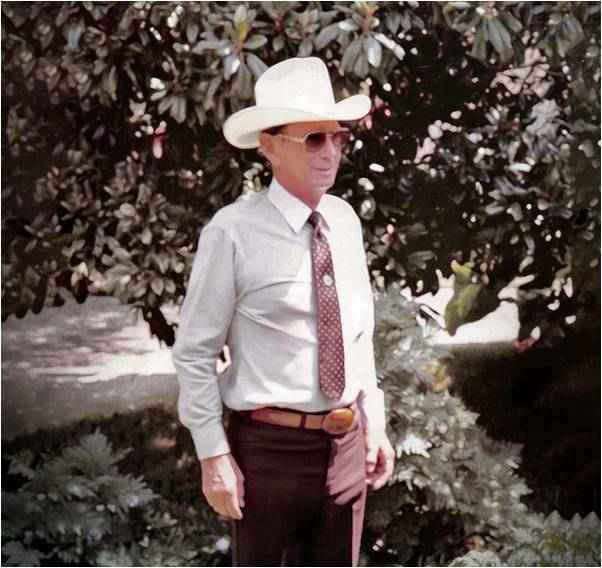 Retiring in 1987 from the Jim Wells County position, he was awarded the title of County Extension Agent Emeritus by the Texas Agricultural Extension Service. Throughout his career, he attended over 40 National County Agent Conventions. Gene and his wife, Susie (Joyce) continued to live in Alice and raise F1 Hereford-Brahman cattle and enjoyed traveling to places that hold a lot of “down home” appeal. During his time as County Agent, Gene worked with the Jim Wells County Fair Association as assistant in the Senior Livestock Exhibit division, chairman of the Youth Showmanship Committee, chairman of the 50th Anniversary Fair Fundraising Campaign and supervised 4-H Club youth in the fair clean-up, paint-up programs. After retiring, he served as chairman and vice-chairman of the Merchants Exhibits and Vendors division. Each year, he made special contacts with exhibitors and vendors for the Merchants outside exhibits division. In an effort to make the fair more attractive for those attending, Gene had formed a committee to obtain the talent of the South Texas Opry from Corpus Christi to perform at the fair. An agreement by the Opry to participate brought on another need: that of a stage in the pavilion building. With the help of several capable volunteers from over the county, a 16 x 28 foot stage was built before the fair in 1995 for the performance and for future activities. Spaniel’s special interest in the fair association was not only to provide a large number of county youth an opportunity for greater advancement, but also, he saw the Fair Association leadership doing more with basically less money coming from taxing entities than any other organization he had ever worked with. Gene Spaniel served in various capacities with several organizations in South Texas including: Secretary, South Texas Hereford Association in Beeville, 1965-1979; Director, South Texas Hereford Association, 1990-present; President, South Texas Hereford Association, 1992; President, Alice Rotary Club, 1985-86; Director, Jim Wells County Farm Bureau, 1990-1993; Director, Jim Wells, Nueces, Kleberg, Kenedy Soil & Water Conservation District #311, 1995-present. Gene also received several recognitions including: coaching the 4th place National Livestock Judging team in National Western Livestock Show in Denver, 1970; the Distinguished Service award for County Agents in 1974 in Tucson, Arizona; Man of the Year in Agriculture for Bee County in 1968; State Plant Food Institute Soil Fertility Award in 1981; awards in the National County Agricultural Agents Association, feature story and single news photo contest in 1977, 1981, 1982, 1983, 1985, and 1986; state winner in Pride Program of the Texas Association; 2nd in the National Crop Production award in 1984; Superior Service Award by the Texas Agricultural Extension Service in 1985, however, the most prestigious award received was the Distinguished Performance Award by the Chancellor of Texas A&M University in 1984. He was a member of St. Elizabeth of Hungary Catholic Church in Alice, Texas. Gene was preceded in death by his parents, two daughters, Lanette Spaniel Caroll and Martha Spaniel; his step-son, Kirby Park, and his sister, Frances Bollom. Gene leaves behind his loving wife of 42 years, Joyce “Susie” Spaniel of Alice, Texas; his son, Mark (Terri) Spaniel of Leakey, Texas; his step-daughter, Susan Park Green of Floresville, Texas; his grandchildren, Karah (Kasey) Guillory, Micah Spaniel, Joah Spaniel, Nathan Spaniel, Nigel Spaniel, Hailey Spaniel, Victoria Spaniel, Destiny Spaniel, Gavin Green, Garet Green and great-grandchildren Beau Green, Curtis Green, and Louella Guillory; one brother, George (Shirley) Spaniel of Jacksonville, Florida; as well as numerous friends, colleagues, and those who had the opportunity to work with and learn from his extensive knowledge in agriculture. Funeral Service will be held on Monday, April 15, 2019 at 11:00 a.m. at Immanuel Lutheran Church, 1400 N. Texas Blvd., Alice, Texas with Pastor Stan Simonic and Pastor Mark Spaniel officiating. Interment will be held at 5:00 p.m. on Monday, April 15, 2019 at St. John the Baptist Catholic Cemetery in Schulenburg, Texas. Expressions of sympathy for Eugene “Gene” Spaniel as memorial contributions may be made to: Immanuel Lutheran Church, 1400 N. Texas Blvd., Alice, Texas 78332 or to First Baptist Church, P. O. Box 56, Leakey, Texas 78873.